In the country of more than a billion people that is enjoying an economic revival, India is the epicenter business market for thousands of industries. The largest shift in paradigm is being experienced in the entertainment market, where cord-cutting is the next big thing. India has been slow to embrace streaming services in general, but the growing infrastructure for internet connectivity is changing it all. With LTE mobile network becoming more accessible, and Internet Service Providers going all in with unlimited data plans, online streaming entertainment in India is better than ever. Thanks to the boost in infrastructure and a gigantic leap in mobile internet technology with the 4G push, streaming services are a rapidly growing entertainment genre. Making the most out of this growing platform of entertainment, here are some of the best premium streaming services available in India right now. Developed by one of the most established names in Indian cable entertainment, Hotstar is the online solution to cord-cutting that India has been waiting for. It brings all of the channels owned by Star, such as HBO, Star Plus, Star World, Star Utsav, Channel V and so many more. With these channels, it brings along thousands of TV shows and movies, making Hotstar the largest library of Indian content available on the market. Apart from multilingual movies and thousands of entertainment titles based in languages like Bengali, Tamil, Malayalam, Marathi and several more, it offers live streaming action of sports TV shows though Star Sports, which is unavailable on almost no other service out there, all of which is not only available to watch for free, but even the premium content costs just ₹199 per month. 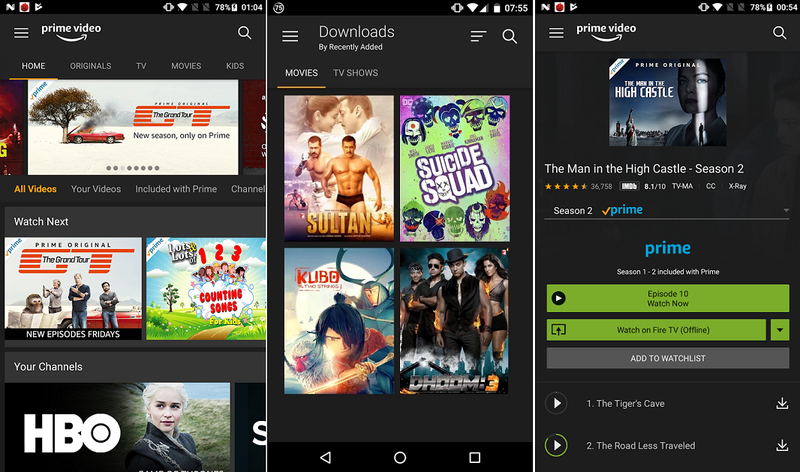 Introduced years ago as a direct competition to Netflix, Amazon Prime Video was only recently introduced to India after the retailing giant spread across the subcontinent like wildfire. This streaming service for Amazon not over hundreds and thousands of international entertainment movies and TV shows, with a bunch of Amazon Exclusive content like The Man in the High Castle and movies like The Big Sick. Amazon Prime Video has also adapted to cater to the taste of the multilingual Indian users, with a collection not just in Hindi, but Tamil, Bengali, Kannada and more. Priced at just ₹999 a year, which includes Amazon Prime delivery service, Amazon Prime Video, and even the newly introduced Amazon Music service with its millions of songs, this streaming service offers good value for money. The largest entertainment streaming service on the planet became a whole lot larger after it decided to spread its wings and add India to its serviceable countries in 2016. Over the last two years, Netflix has managed to penetrate the market with a limited number of Indian content in Hindi language only and signed deals for exclusive rights to movies from big names in the Bollywood industry. However, the majority of the Indian audience that enjoys Netflix is for its English content, most importantly the Netflix Original content. From series like Altered Carbon and Narcos that are exclusive to the streaming platform to movies like Bright and some of the top-rated IMDB movies you won’t find elsewhere, Netflix carries a heavy price tag of ₹650 just for the Standard subscription. Another streaming service that is rapidly becoming the Blockbuster of online Indian entertainment, HOOQ is one of the more content-heavy services on the list. Starting off at just ₹89 per month, you get access to over 10,000 TV shows and big-name movies over the TV screen and mobile app with sharing for up to 5 devices. 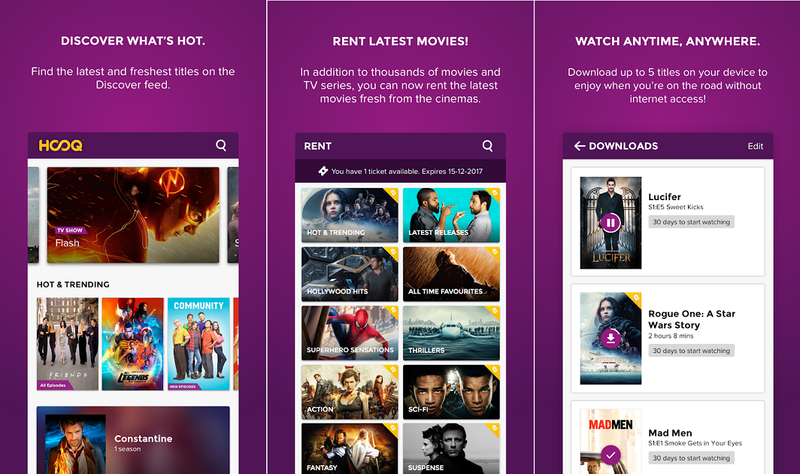 However, what sets apart HOOQ from the other names on the list is the fact that it comes with a rental-based feature to bring you the latest movies. For just ₹59 per movie title, HOOQ enables you to enjoy the latest blockbuster hits currently theaters without leaving the comfort of your home. 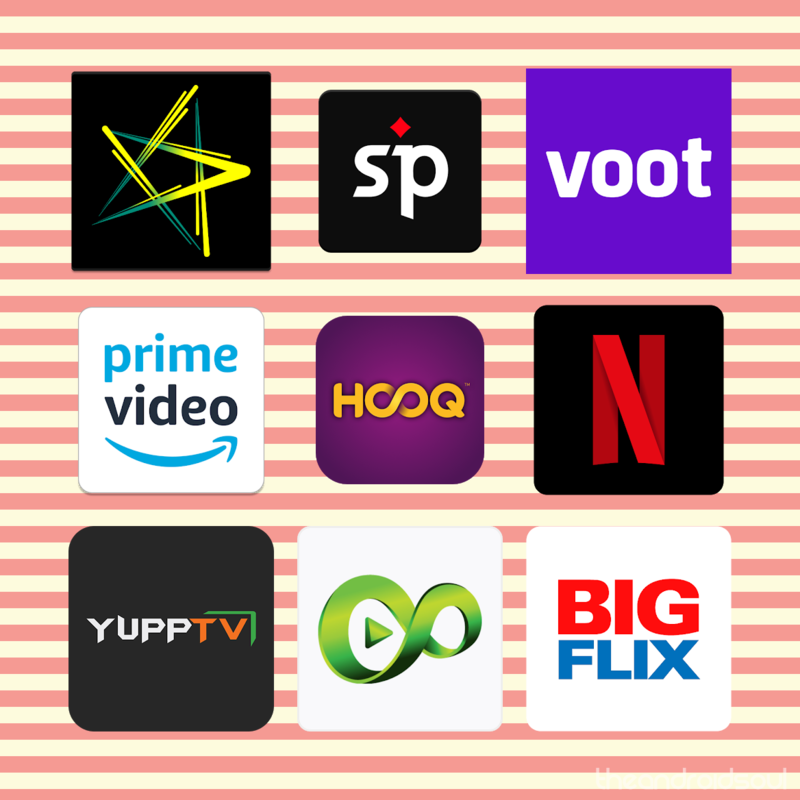 To compete with cable entertainment companies turned streaming services like Hotstar, Viacom 18 has introduced Voot to take the Indian streaming market head-on. 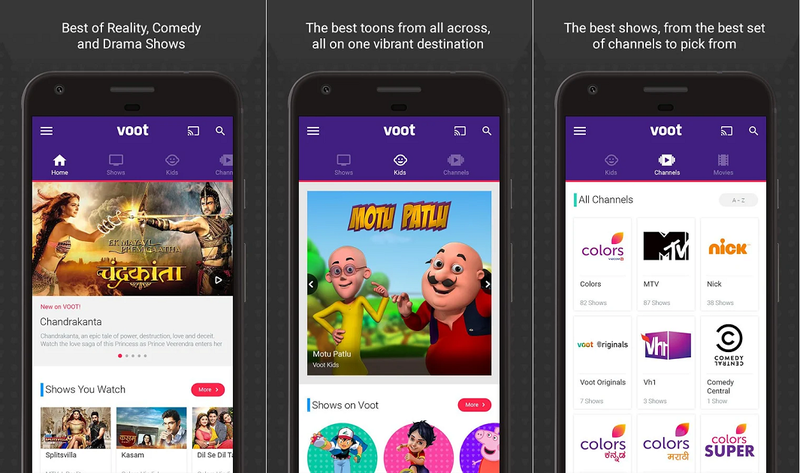 When it comes to regional TV entertainment, Voot takes home the prize with Colors and all of its regional versions, along with other popular channels like MTV, Comedy Central, and even Nickelodeon for the little ones. Unlike any of the other premium streaming services available, Voot is absolutely free at the moment. While you don’t get any English entertainment with Voot, their in-house TV shows, a small yet enjoyable collection of Hindi, Kannada, and Bengali movies are plentiful to keep your entertained without spending a single cent. Following in the footsteps of U.S. network carrier brands like Comcast that bundle internet and broadband connectivity with entertainment services, Airtel TV is also taking a step in the right direction. Offered with Airtel Postpaid services as well as V-Fiber Broadband, you get unrestricted access to bucketloads of Bollywood, regional, and even tons of International content. What makes Airtel TV stand out from the big names in the business such as Netflix and Amazon Prime Video is the ability to watch TV channels across the language spectrum and even rewind the content. 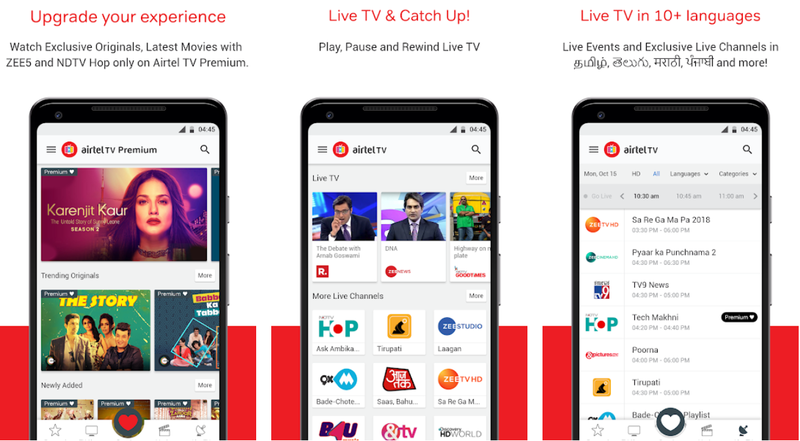 Airtel TV even offers interconnectivity among ZEE5, Eros Now, HOOQ, YouTube and many others to offer you plenty of entertainment premium content from a single app. Keeping up with the audience of the 21st century that demands high-quality content on the online platform, ZEE5 has been designed to be a truly multicultural video streaming service just like the multicultural country is has been designed for. 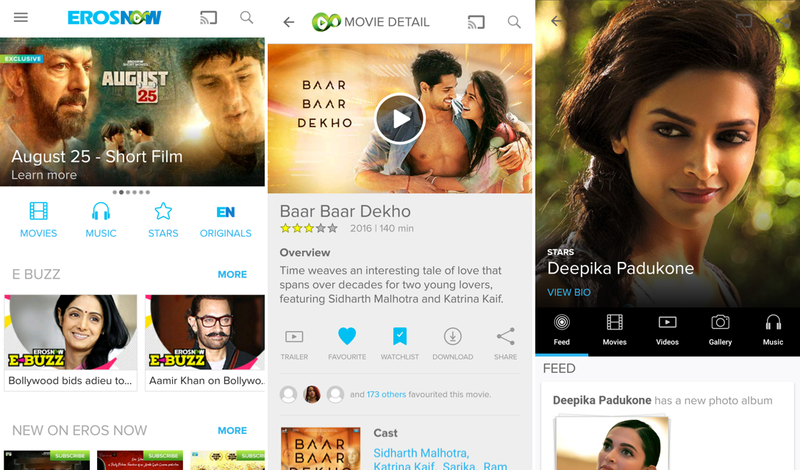 Allowing Indian users of multiple dialects to enjoy movies dubbed in Hindi, Bengali, Malayalam, Tamil, and Telugu, there’s the ability to download content for offline viewing as well. Offering the ability to view live TV with a channel guide to keep your viewing schedule organized, ZEE5 comes with more than 80 different channels to click through. There’s no limitation to international content either, with a premium selection of not just English, but Turkish, Korean, and Spanish movies and TV shows lined up for your viewing pleasure. The biggest woe of Indian entertainment lovers outside India is the fact that most of the popular regional streaming services are not available outside the country. Starting for $7.99 for the regional users and upwards of $11.99 for users outside of the country, there’s a lot that you get with YuppTV. The service starts things off with a free trial, you get a massive collection of unlimited movies and a whopping 10 days of catch-up TV show-entertainment. 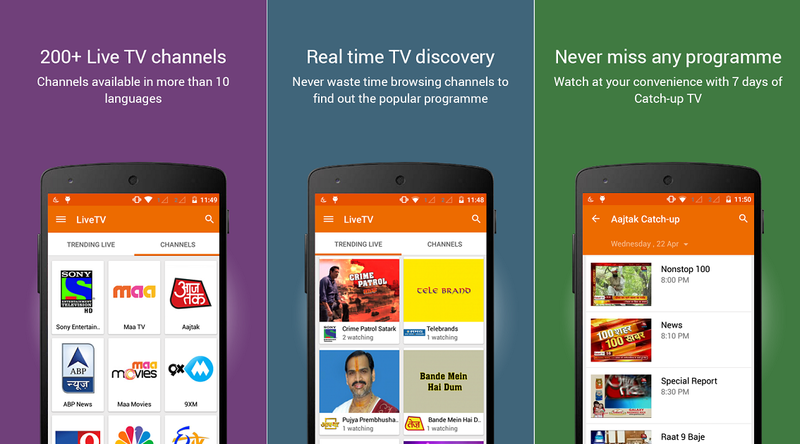 The collection includes TV channels, exclusive YuppTV movies, regional language shows in Marathi, Malayalam, and others, along with a decent collection of news channels as well. Unlike the premium services listed in this list, SonyLIV operates independently as a freemium streaming Video-on-Demand service. From offering unlimited access to movies, TV shows, special short films, kids-friendly content and so much more, there is a special focus on live cricket streaming which is exclusively licensed to SonyLIV only. 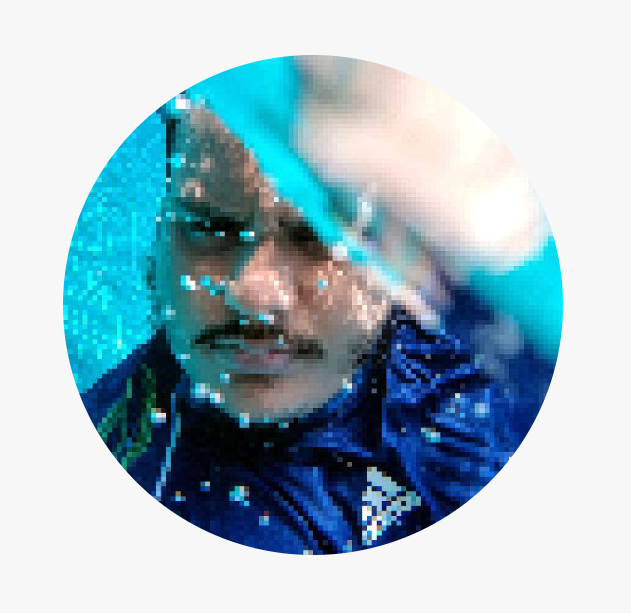 Focusing more on Hindi-language entertainment with top shows from the Sony Entertainment Network, you even get football, tennis, and even special access to wrestling entertainment shows online. The best part is that all of this exclusive content is free for viewing, although an affordable premium membership makes the entire app add-free with hours of premium content. A gigantic name in the Indian film industry that has joined the online entertainment revolution to keep up with the growing demand, Eros Now is just the service for Hindi-exclusive entertainment. Harboring a massive collection of Hindi movies ranging from the retro 1980s to the latest blockbusters, Eros Now also maintains a tiny and unimpressive range of English movies too. At the subscription rate that starts at just ₹49 a month, the service is fairly affordable, justifying the limited categories available. Eros Now still manages to offer some exclusive TV shows such as eBuzz, maintains a healthy range of music video library, and even offers some specialty TV channels like Hum TV from Pakistan for Urdu TV show lovers. Another exclusive streaming service that is dedicated to the Indian entertainment industry, Spuul is growing into a massive movie-library for the Bollywood fanatics. Spuul is currently the only service we’ve seen offer Punjabi entertainment and specialty movies on an affordable rent-based payment system. Spuul offers a movie-only experience at just ₹150 per month, but the fact that you get a whole lot more with a little more money with services like Hotstar makes it less desirable. One special feature that comes with the mobile app is the ability to download movies at reduced download size and watch content while it is being downloaded. While most of the popular streaming services in India lock horns over the latest and greatest movies and TV shows, ALTBalaji offers a refreshing spin on VOD content. Offering some of the most critically acclaimed original web series created by in-house writers and award-winning directors, ALTBalaji brings an Indian spin on the Netflix Originals concept. With the ability to watch ATLBalaji TV shows on 5 different devices simultaneously in 6 different languages, this premium, yet cost-effective streaming service comes entwined with some of the Blockbuster hits as well as comedy shows to tickle your funny bone, all of this with not a single international movie or TV show in sight. What makes this online streaming service stand apart from the rest of paid options on this list is that JioCinema is a part of the Jio Prime membership, making it freely available to all Jio mobile network users. Not only are movies available in multiple languages, you even get dAlthough the collection of movies that you get with JioCinema is not as vast as some of the toppers on the list, the fact that it is entirely free of cost to Jio users also makes worthwhile. Reliance hoped to become the Netflix of India all the way back in 2011 by bringing online movie rental service to the region. The plan didn’t really work out due to the infrastructure restrictions, but the industry giant is back to compete with the big names in the business with BIGFLIX. Starting at just ₹50 for Indian users and $1.50 for users worldwide, BIGFLIX comes with thousands of Hindi, Telugu, Tamil, Marathi, and several other regional titles from over the years under a single wing. This service by Reliance Entertainment hopes to fill the void that big names like Netflix and Amazon Prime Video have left with limited regional content. If you’re already paying a fair share for premium foreign entertainment services and looking for a free alternative, Zenga TV is the one for you. Packing a whopping more than 100 channels that are set on live playback 24/7 for all genres of entertainment, there’s a cable-free connection there for you at all times. 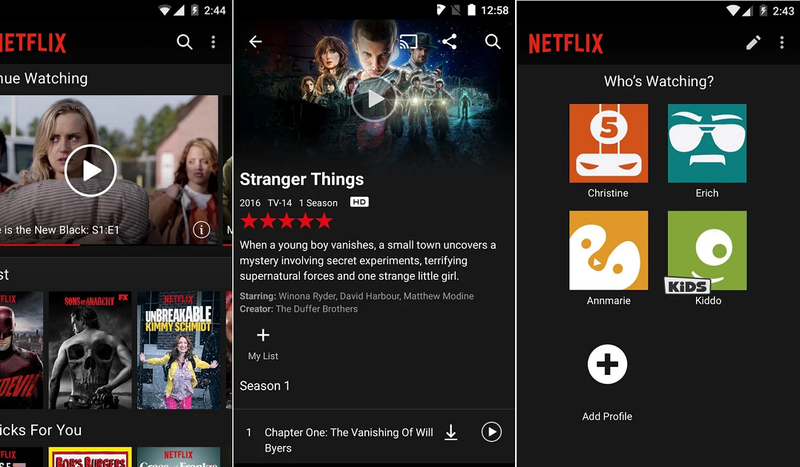 There are limitations that come with the free streaming service app, especially when it comes to the quality of content available. More importantly, the playback quality is restricted to just 480P at the maximum rate, which could be a deal-breaker for those who are too comfortable with the UHD quality that Netflix and Amazon Prime Video offer. Are any of these premium Indian streaming services good enough to take down the big names, or will you still stick with the ones you’re familiar with? Be sure to share your thoughts in the comments section down below. Which streaming service are you using in India? Or which one you plan to subscribe to?